Federal Judge In Hawaii Blocks Trump's Third Attempt At Travel Ban : The Two-Way President Trump's third executive order restricting travel from some countries to the U.S. was to go into effect on Wednesday. The judge didn't rule on the limits affecting North Korea and Venezuela. People marching in the "#NoMuslimBanEver" rally in downtown Los Angeles on Sunday. 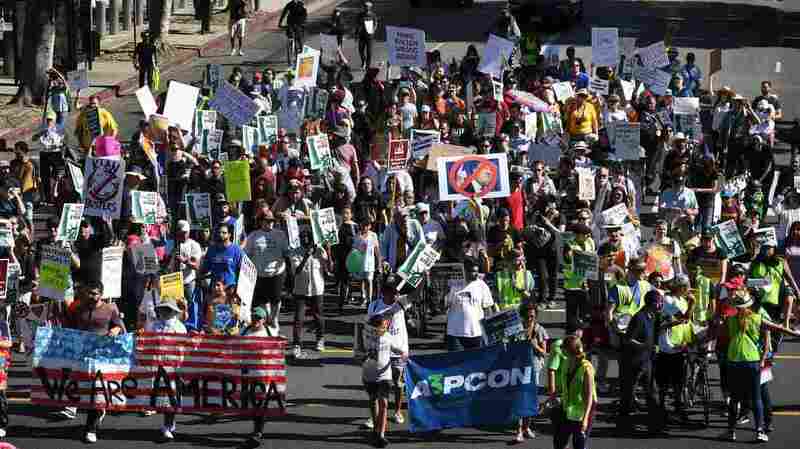 Organized by the Council on American-Islamic Relations, the march was in response to President Trump's most recent travel ban, which has now been partially blocked by a federal judge in Hawaii. In his ruling, Watson wrote that the third version of the ban, like those before it, "lacks sufficient findings that the entry of more than 150 million nationals from six specified countries would be 'detrimental to the interests of the United States,' " evidence that he says would be necessary for the ban to be enforceable. The Department of Justice said in a statement that the ruling "is incorrect, fails to properly respect the separation of powers, and has the potential to cause serious negative consequences for our national security." The White House, in a separate statement, said the judge's decision is "dangerously flawed." "The entry restrictions in the proclamation apply to countries based on their inability or unwillingness to share critical information necessary to safely vet applications, as well as a threat assessment related to terrorism, instability, and other grave national security concerns," the White House says. "These restrictions are vital to ensuring that foreign nations comply with the minimum security standards required for the integrity of our immigration system and the security of our Nation." The ruling in Hawaii v. Trump is the latest in the legal tug of war over Trump's attempt to impose a ban on travelers from predominantly Muslim nations. In early March, Trump signed a new executive order. As NPR's Joel Rose reported, "There are some key differences between Trump's original order and this one. It applies only to people from six majority-Muslim countries. Iraq has been dropped from the list. Lawful permanent residents or green card holders are explicitly exempt. So are travelers who already have valid visas. And refugees from Syria are no longer banned indefinitely, though the U.S. refugee program is still suspended for 120 days and the number of refugees admitted this year cut by more than half." That set the stage for the U.S. Supreme Court to intervene. In late June, the justices allowed Trump's travel ban to take partial effect, but they allowed people with "close familial relationships" with someone in the U.S. to enter the country. In September, the 9th Circuit ruled the government couldn't bar entry to grandparents and other extended family members. However, the Supreme Court did allow the administration to ban refugees even if they had formal ties to U.S. resettlement agencies. "The latest version of the travel ban — version 3.0, if you will — limits travel from Iran, Libya, Syria, Somalia and Yemen. The nations of Chad, North Korea and Venezuela have been added. And Sudan, which was part of the original ban, has been dropped. "The new rules take effect Oct. 18. And unlike previous versions, the new ban is not temporary. It will remain in place until the affected nations comply with stringent requirements for vetting their citizens before they can receive visas to enter the U.S."
That's the version of the ban that has now been blocked from going into effect, nationwide — at least for now. However, the state of Hawaii did not challenge the ban as it applies to North Koreans or Venezuelans. Therefore, the judge's restraining order does not apply to those portions of the ban, which can be enforced starting Wednesday.